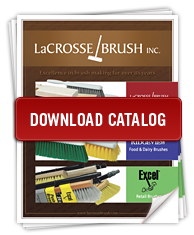 La Crosse Brush Inc. was founded in 1926, therefore, 85 years of brushmaking experience is represented in this catalog. We are proud of our heritage and as La Crosse Brush Company Team Members extend our commitment to you that our “La Crosse Brushes” as in the past will continue to stand for QUALITY. All La Crosse Brushes have been designed with your applications in mind and are manufactured with only the finest materials for efficient use and long lasting performance. We thank you for your interest in our products. Your satisfaction is guaranteed and our commitment to you is PREMIER CUSTOMER SERVICE. This means we will strive to manufacture and distribute the highest quality products on time and at a fair price.